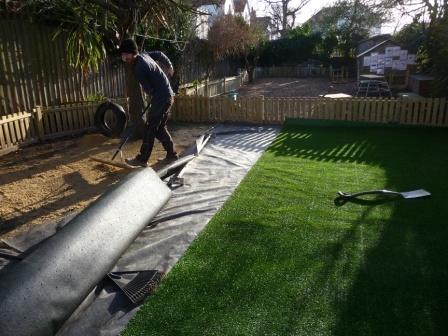 We were asked by an old friend if we could solve the problem of the mud patch in their play area at the Home from Home nursery in Hove. 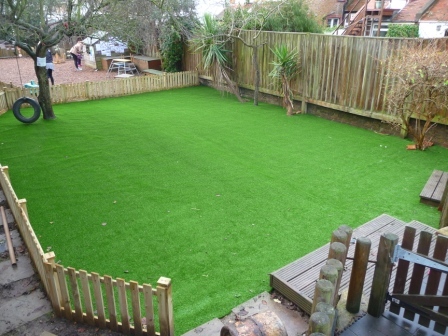 The obvious solution was to fit artificial grass to the area. This sound quite straight forward but there a vast amount of different types for different applications. We got samples from a range of suppliers and looked at the particular situation and how best to solve it. Long curly pile preferably with a couple of length fibres seemed the best option for young knees and hands. This offered the better wear and tear and still was soft to the touch. After measuring up the area and looking at different options with the client,we placed our order for the type of turf that we settled on. Once we had one side fitted the difficult part is matching up the join as there should be no obvious seem to the turf and if you have ever tried to get an iPhone screen guard on cleanly before you’ll know it is not as easy as it seems! We used a special outdoor adhesive with a fabric backer that was specifically made for the job. 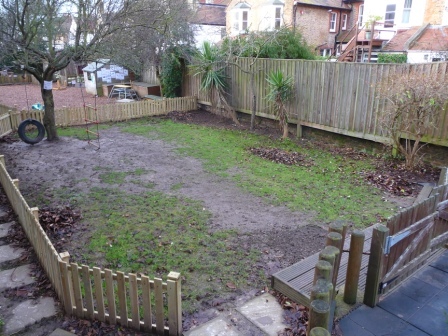 This is now a much better area for the kids to enjoy all year round. And with the added benefit of full drainage the area will no longer be a mud patch that offered little or no use in the winter months. Finished installation. The kids will love being out all year round now and no dirty clothes to deal with later. The pile height on this was a minimum of 20mm so the soft swath would be kinder to small hands and knees come play time.